It hit me last week: I have about 3 months left to prepare for the PCT. I have 3 months to make, dehydrate, and repackage up to 5 months of food! Food is a super common theme amongst PCT hiking discussions. It sort of becomes the centre of your universe as your day revolves around breakfast, snack, lunch #1, lunch #2, snack, dinner, snack. Sounds like a lot of food, right? Turns out backpacking burns quite a few calories and getting those calories is of utmost importance in maintaining energy levels and health. Depending on the weight of your pack and your weight, the average person will be burning approximately 500 calories/hour which, over the course of a 10-12 hour day, means upwards of 5,000 calories (of course, a little more or less depending on terrain and number of breaks). Buy as you go: There are a number of towns along the way and resupplying along the trail is possible. Mail your food: Prepare multiple boxes ahead of time and mail them to said towns. I’m sure you’ve guessed which option I’ve decided on. This is primarily due to that fact that many of those towns are quite small and if you relied on the buy-as-you-go strategy, you will be reduced to eating gas station/convenience store type of food quite often. Many people are successfully able to do this, however, I know I can’t. Preparing that much food, although time consuming, doesn’t seem like a huge chore for me. I enjoy cooking. 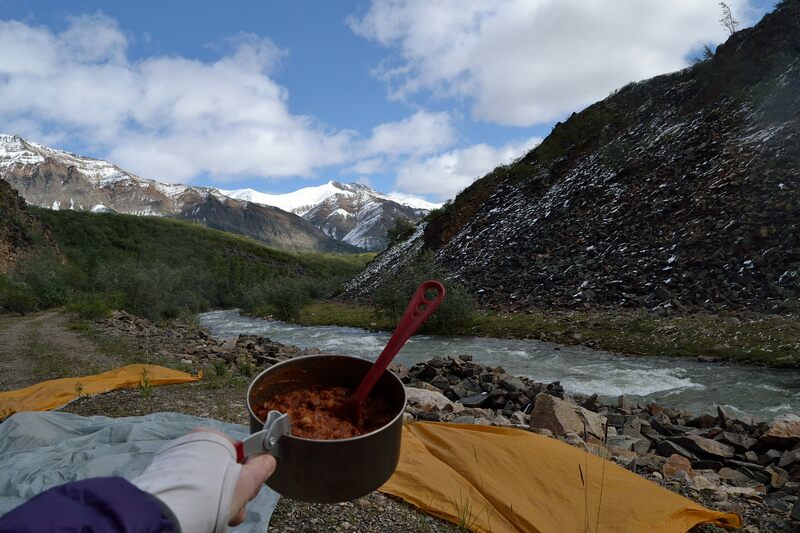 I relish the thought of my meals while on trail as there is something AMAZING about finishing your day with an incredibly delicious chili you made. I’ve tried some of the pre-made, backcountry meals that are available and while some of them are quite good…I don’t know, your own homemade stuff is always better. Plus, it’s significantly cheaper to make your own. The other factor involved in my choice to prepare meals is due to the relationship I see between my body its performance, and what it’s being fuelled with. I have seen the difference in my performance when I consume junk food compared to how I perform on healthier fare. I seem to be sensitive to these fluctuations more so than some other people and coupled with being lactose intolerant and having an egg allergy, my options can be limited. Hey, if I could get by on plain ramen noodles I probably would! But I know my health and energy would falter resulting in a significantly less-than-pleasant experience. And so, I cook! But where to start? I’m using my experience this past summer on the CANOL Heritage Trail where 2 of us needed to cook food for 20 days (there are NO towns for resupply options: we had to bring everything). 20 days seemed overwhelming at first but it was just a matter of breaking it down into sections. I took 1 week and did a sample menu on a spreadsheet and then put it on repeat: 7 days of different meals. If it looked a bit repetitive, we simply subbed out a few days of different items to mix it up (such as Bacon Cornbread Day on our resupply day!). I’m taking that same process and now applying it to 4.5-5 months. I’m figuring about 20 weeks so I’ve made a spreadsheet and typed in meals. I’ll repeat that and then sub in some alternatives if it looks too repetitive. It gives me a base to start from to figure out how much of something I need to make. Of course, things will change while on the trail and I’m not actually planning on bringing EVERY. SINGLE. MEAL with me (could you imagine? 5 months of 3 meals/day…plus snacks!). I have another spreadsheet that’s helping me figure out towns where I can buy decent resupply and/or where I’ll likely end up eating in town. I’m not tied down to my spreadsheets they are simply a tool to help me plan and give me a starting point. My intention is to mail myself common meals but then buy snacks and fillers as I go (such as peanut butter, trail mixes, or tortillas). Curious as to what can be made and then dehydrated? I was amazed when I learned that you can go beyond making apple or banana chips! I remember seeing Rachael dehydrate spaghetti sauce for a ski trip one year and I was blown away: I just had no idea you could do that! Through some trial and error, I now tend to stick with doing vegetarian versions simply because I find meat often takes so long to rehydrate. Food Drop – variety was key for us! Variety is key! With minimal effort, I’ve already created a menu for more than two weeks of lunches & dinners without repeating a meal and without considering what I could buy in town (such as packing out the fix in’s for salami wraps or buying a hamburger in a restaurant). I’m not sure about you, but I know even at home we tend to repeat a meal or two within a two week period! 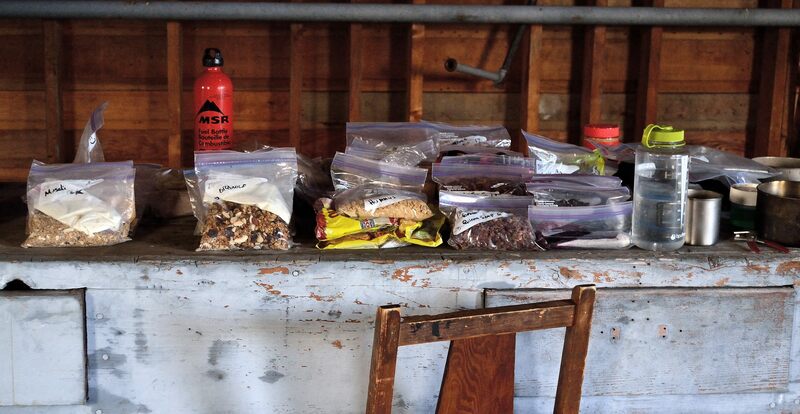 Hopefully that provides you with some insight on how I’m planning food for the PCT. If you’d like to know more, want a recipe, or interested in more details, please write to me or leave a comment below and I’ll be happy to continue providing updates on my planning for the PCT! This all sounds much more delicious and nutritious than the packet pasta meals I ate far too many of while cycling across Canada. It’s so hard to find fresh food when the only shop you may pass it a gas station. LOL – Neither of us have been able to buy and/or consume canned tuna and it’s been, what, 4.5 years?! I may have to get over that since those tuna packets are really popular for adding some bulk and protein to meals since they’re fairly inexpensive, readily available, and easy to pack out of gas stations…we’ll see…the thought of it sort of makes me gag right now though!! I’m the same with cereal bars. I never want to eat one again! Yeah, I feel for people coming from overseas! I’m lucky to live so close to the border for this trek so mailing my food is simple. I’ll make you a deal: when I get sick of one of my meals we can do a switcheroo for whatever you have in your pack! !